Conflict between multiple parties in Syria’s Deir-ez-Zor governorate escalated in the latter half of 2017, displacing an estimated 230,000 individuals and resulting in a deterioration of the humanitarian situation . Although the recent de-escalation of conflict in the north-west area of the governorate has allowed some humanitarian assistance for the first time since 2014, there are still significant access limitations. As a result, humanitarian actors face substantial gaps in their understanding of the location and priority needs of non-displaced residents, returnees and internally displaced persons (IDPs). In order to address these gaps, REACH has conducted an assessment of the humanitarian situation in host communities and informal IDP sites across Deir-ez-Zor governorate. Between 31 January and 4 February 2018, an initial assessment identified populated areas and population estimates for each location, and a community-level multi-sectoral assessment of humanitarian conditions followed between 7 and 13 February. In each stage, REACH collected data through 89 remote Key Informant interviews with residents of Deir-ez-Zor. The assessment found key differences in humanitarian access, humanitarian conditions, and numbers of IDPs and returnees across sub-districts. Areas controlled by Syrian Democratic Forces (SDF) in the north-east host large numbers of IDPs and have begun to receive sporadic humanitarian assistance, though security issues restrict access and populations remain in need. 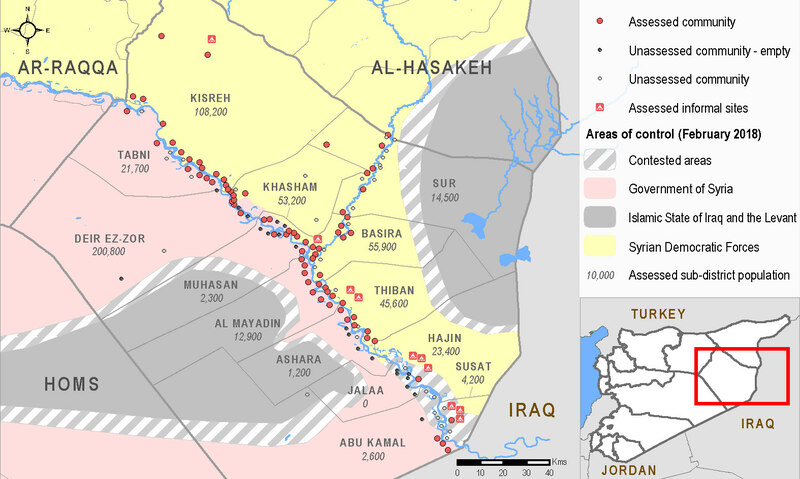 Government of Syria (GoS) controlled areas on the south-west bank of the Euphrates river are more sparsely populated, with few reported returns. Humanitarian access is extremely limited in the south-east sub-districts of Hajin and Susat, where households have relocated to informal sites to escape active conflict lines. Throughout the governorate, severe humanitarian needs persist. Health services are inadequate due to the lack of qualified medical professionals remaining, and civilians seeking treatment often must travel to Al-Hasakeh or Damascus. Access to electricity is also deficient, as most communities and informal sites have between two and four hours of power each day. As a result, households in nearly all locations require non-food items such as sources of light and heating fuel. Needs in all informal sites are particularly severe: IDPs are sheltering in tents and lack sufficient access to latrines, leaving open defecation as their only option. As some communities and informal sites continue to receive returnees, and others IDPs, additional health, WASH, and non-food item support will be critical for households in both communities and informal sites. REACH will continue to assess displacement trends and ongoing humanitarian needs in the governorate in order to inform the humanitarian response. Please access the factsheet at this link. OCHA, “Syria Crisis: Northeast Syria – Situation Report No.20”, 21 January 2018.